From time to time, movie studios and/or independent printers will honor a particular film by releasing what is known as an "Anniversary Poster," marking a milestone in time for a classic movie. 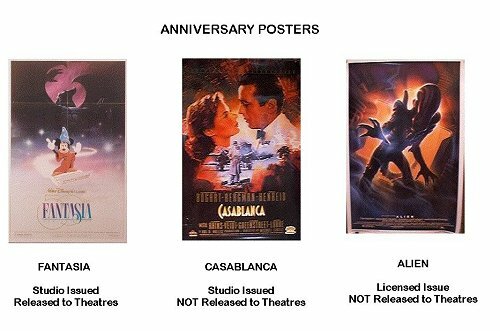 For example, posters were issued for the 50th anniversary of Casablanca and the 20th anniversary of Star Wars. These posters are generally printed in limited numbers (some or actually individually numbered) and are released to the public for sale. This is where an anniversary issue differs from a "reissue/rerelease ". A reissue/rerelease is issued by the studio directly to the theatre and is not for public sale. However, there have been exceptions. In the case of Disney�s Snow White and the Seven Dwarfs for example, the studio issued a one sheet which contained the banner "50th Anniversary. Disney issued this poster for advertising purposes only to coincide with the reissue/rerelease of the film to the theatres and it was not for sale to the public. In this case, it would be considered a "reissue/rerelease" and not an anniversary, even though it contains the 50th Anniversary banner. Disney then licensed the poster for a commercial issue to the public. Because anniversary issues are by their nature a testament to a particular major film, they normally contain beautiful artwork. Some are even printed on gold or silver mylar. There have been occasions where anniversary issues will contain artwork that was created at the time the film was initially made but for whatever reason not used at the initial release. This is true in the case of the poster released for the a 10th anniversary for the Return of the Jedi,regular issue. Only "movie classics" are honored by an anniversary issue. Since original paper on most of these classics is extremely rare and expensive, the anniversary posters give movie fans an affordable alternative. In most instances, these anniversary posters are more beautiful than the original poster and are released in limited numbers to give them a collectible value. Quite often they are individually numbered (somewhere on the poster, most likely the bottom right hand corner.) classifying them as limited edition. For a list of images of anniversary issues in the MoviePosterDataBase, click here.